Touch restrictions are a common sight throughout all levels of football training. They are a useful tool for overloading all aspects of the game. Limiting the amount of touches a player is permitted per possession encourages a higher rate of footballing actions, thus allowing less time for perception and decision-making processes, as well as increasing physiological demands as players have to adjust more often to the position of the ball – both in and out of possession. With less time available, greater emphasis is placed on the effectiveness of these pre-technical actions – positioning, pre-orientation, scanning to name a few. Inefficiencies in these actions will most likely result in a loss of possession, providing a means for players to gain feedback and reflect themselves on their performance. However, football is a game of many rhythms, not just one-touch combinations. Understanding how and being able to control the rhythm of a game is an important part of controlling possession. Too fast a rhythm at the wrong time can lead to players receiving the ball before their teammates are able to support them, isolating them. Too slow a rhythm allows the opponent plenty of time to shift with the ball, making it more difficult for the team in possession to play through them. Since they have to assess and decide how many touches they need in the full game, touch restrictions in training exercises can restrict the opportunities players have to make certain decisions. The choice a player makes to take more or less touches as a means to speed up or slow down play is a significant one, but limiting touches as a rule takes this decision away. As such, when using global touch restrictions (e.g. one-touch, two-touch), understanding the type of play they condition and promote is paramount. A common way to bypass this is to use small areas for exercises and games. In reduced spaces, there will often be a need to play with less touches due to the enhanced access the pressing players gain, while there will also arise a number of opportunities for players to slow down the rhythm when appropriate (e.g. to attract pressure from one defensive line, creating space between lines or elsewhere). As a response to some previous action. This style of exercise will be familiar to many readers – indeed, our very own Moritz Kossmann has already mentioned it in this very advent calendar. We have used this type of exercise both as a position game and as a SSG, both to great success. In position games, points are scored by either playing a number of one-touch passes (e.g. 5 one-touch passes in a chain of possession equals a point), by a neutral player playing a one touch pass, or a one-touch pass played to a third man. In SSGs, just as in Moritz’s piece, points are scored by one-touch passes to a third man, with a greater number available by scoring into small goals. This season, our squad only has one goalkeeper. While this could potentially limit, somewhat, the types of games we can play, we have found that employing a ‘first touch finish’ rule is an effective way of allowing us to play bi-directional games with the player constraint we have. Occasionally we will add an obstacle inside the goal (e.g. a smaller goal, a bounce-board, or a building-site-like barrier) which acts as a stationary goalkeeper. Additionally, such a rule actually promotes some of our desired behaviours — namely moving forwards together in possession as to not isolate the ball-carrier in an unfavourable position, and fast ball-circulation in advanced areas to best take advantage of any space left for an open shot. Out of possession it promotes the idea of maintaining access to multiple offensive players, as well as pressing intensely as the pass is played as to arrive to the receiving player at the same time as or even before the ball. The following two games have been a staple of our training this season. Our 5v5+3 “midfielders game” requires all three neutral ‘midfielders’ to touch the ball for one team before a goal can be scored, while also ensuring that all three are not in the same half of the pitch. Each neutral has only one touch the first time they receive the ball, with unlimited touches after that. In doing so, they are still exposed to the demands of playing with reduced touches, albeit less frequently, while also experiencing free play. 5v5+3 midfielders game. Neutrals must take care to make sure they are all not in the same half – a rule from which interesting rotations emerge. Our 4v4+4 “wingers game” is a weekly competition played with the age group below, with a league table, promotion/relegation, and fixed teams over the whole season. The four neutrals divide themselves between the two halves. Both the ‘attacking’ neutrals (i.e. the neutrals in the half the team in possession are trying to score into) must touch the ball before a goal can be scored. They have one touch the first time they receive the ball and unlimited touches after that. The neutrals in the defensive half (full-backs) have a constant two-touch limit. The first team to score two goals wins, with the losing team swapping with the neutrals. Both games give rise to a number of tactics and strategies, stemming from neutrals’ requirement to receive a pass before scoring. Cutbacks and low crosses from winger to winger are common in the “wingers game”, as is third-man action to lay off a forward-facing shooter. Teams in both games will sometimes resort to man-marking the neutrals in order to prevent them from receiving the ball, and thus hindering their opponents’ ability to score. In these cases, the team in possession must remain patient, waiting for the right moment to find the neutral – whether that be directly or as the third man. In both games there is a “high press” rule, waiving the need to play with the neutrals if possession is won in the opponents’ half. 4v4+4 wingers game. Teams are split between a ‘top’ pitch and a ‘bottom’ pitch, with wins on the top pitch being worth double the amount of points as those on the bottom. The final prominent way we use variable touch restrictions is in position games. Especially in depth-oriented position games, played in longer, thinner areas, there is almost always the ‘easy escape’ of a high, direct pass from end to end, completely killing the defending team’s pressing. One potential solution to this is to ban passes above an arbitrary height – thus forcing the play to go through feet in the centre or directly through a well-opened gap. While this does somewhat solve the problem of bypassing the point of the exercise, it completely removes the lofted pass option from the end players, when this is a useful part of, say, a central defender or goalkeeper’s arsenal. Instead we play such position games with the condition that any end-end direct passes must be followed by a one-touch layoff. This restricts the end players’ ability to destroy pressing with an aimless clearance with no consideration for the situation the receiving player gets the ball in, since they no longer have a touch or two to bring the ball down and wait for support. Players in the middle must move quickly to support the long pass for the layoff, as they should come match day. An example of a position game using this condition. Blues play end to end, 5v3, with direct passes followed by a layoff. When the whites win possession, they turn and play 5v3 against the blues. Avoid playing the first pass into midfield to the closest man-marked player, unless it is with the intention of pulling the marker out of position. The marked players tend to be allowed only to face their own goal when receiving, so a pass from centre-back to a marked 6 will most likely result in the ball being played back to the first line. To progress the ball forwards, look for the furthest available player, since he should have options to set the ball back to a forward-facing player in a more advanced position than the ball started at. As mentioned before, since most of our opponents defend with some level of man-marking in midfield, playing with reduced touches and with third-man actions play a vital role in our ability to keep possession and break teams down. Against extreme man-marking opponents (3-4-1-2 against our 4-3-3), third-man action from our 9 to either one of our forward-running 8s has been very effective in breaking through the last line. 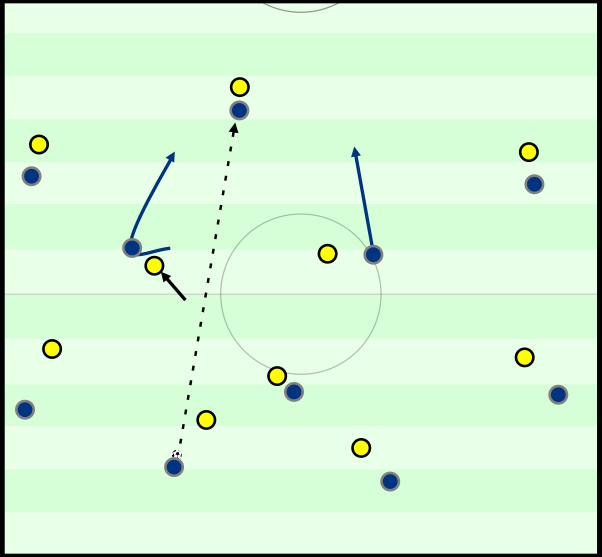 In games when we struggle to play through the centre (for whatever reason), we will use winger/full-back rotations to provide an option in depth (often resulting in impressions of Jordi Alba, Spain 2012) and potentially a free player in the halfspace for further third-man action with the 6 or 8s. A typical scene against one of our more extreme man-marking opponents. The opening of the direct passing lane and the timing of the forward runs from the 8s saw us break through without much difficulty. Variable touch restrictions sit in the ‘Goldilocks zone’ of constrained coaching. They direct the promotion of certain behaviours more efficiently than completely free play, whilst maintaining the fidelity in decision making and rhythm seen in the full game. While I have only shown a handful of examples, there are plenty of ways to use such restrictions to suit a whole host of development goals and game models.